During the late 17th and 18th Centuries, the Orient offered a taste of the exotic, a perceived glimpse of an alternative, almost magical, culture known only through the romantic writings of the occasional intrepid traveller such as Marco Polo. 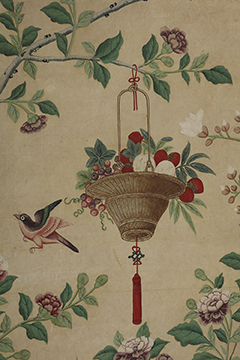 Chinese wallpapers played an important part of this 18th Century Fashion for Oriental interiors, providing a rich and colourful setting for prized collections of oriental porcelain, silks, lacquer and other export wares brought over by the East India Companies. 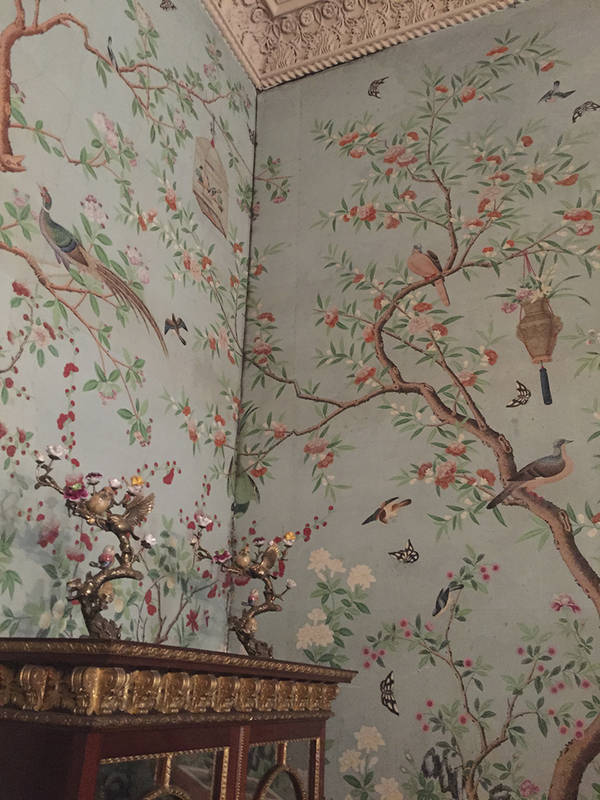 Historically, the creation and use of such papers was not a Chinese tradition and research suggests that these were a largely European construct, devised to fulfil the expectations of fashionable clients and their decorators, such as Thomas Bromwich and Thomas Chippendale. The client often took an unusually active personal interest in their choice and acquisition with wonderful examples surviving in major houses including Harewood House, Yorkshire, Fellbrigg and Blickling Hall, Norfolk, and Saltram in Devon .These gorgeous papers were both printed and painted by hand, using luscious colours such as malachite, azurite and the deep rich crimson of carmine. They must have appeared almost jewel like in their vibrant explosion of detail and colour, providing a delightful contrast to the dour formality of wainscot, tapestry and damask and were usually used to enliven private apartments such as bedrooms, dressing rooms and cabinets.The fashion for Chinoiserie gained second wind during the 19th century, inspired by the eclectic exoticism of the Prince Regent and the Royal Pavilion, Brighton. Examples still survive at the Pavilion, and also at Buckingham Palace in the Yellow Drawing Room on the First Floor, whilst a similar paper hangs at Temple Newsam House in Leeds.By the time of the fashionable “ English Country House Style’ , invented by Nancy Lancaster in 1920’s and 30’s, Chinese Wallpapers had achieved the status of covetable antiques, being sold both as rooms and panels and spawning a cottage industry of talented copyists. Similarly today, we have re discovered the magical beauty of Chinese wallpapers with originals achieving high prices at auction and modern interpretations proving highly desirable. 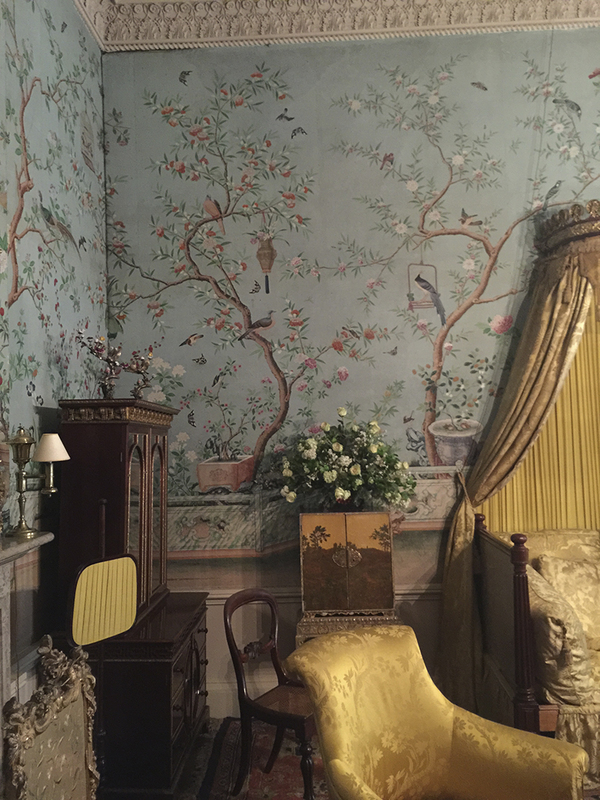 Having conserved so many of these wonderful wallpapers, we are delighted to be able to offer a selection of our favourites including several from The Royal Pavilion and Belvoir Castle as fine art, authentic replicas . These are of exceptional quality and retain all the charm and subtlety of the aged originals, slightly faded, distressed and gorgeously elegant. A collection of authentic 18th and 19th century designs recreated from our wonderful archive of original, handpainted Chinese wallpapers. Each is unique and is specially designed in any style or bespoke colour way to suit your room, whether in framed panels or continuous panorama taking into account architectural features such as dado rails or fireplaces. These magnificent papers are specially printed in our studios using the highest quality fine art acid free Kozo papers and water based pigment inks. Many of the papers and pigments used by the Chinese for these wallpapers are vulnerable both to light and the effects of acidity. Oriental paper is by its nature soft and flexible, but it is also highly hydroscopic and will readily absorb any moisture-borne pollutants. Many examples of Chinese wallpapers, although once white, pale green (malachite) or powder blue (azurite), have become dark brown, fragile and brittle due to the absorption of acidity from both the lining materials and glues and the ambient atmosphere. Brilliant yellows and vibrant pinks and purples, being based on organic dyestuffs, have faded in well lit rooms, often unprotected by blinds.Modern heating systems also take their toll as these are often difficult to control and may cause hot dry atmospheres. Similarly, modern lighting can be excessive and produce both heat and UV radiation. Based on this evidence, historic buildings are perhaps the worst environments in which to display such sensitive materials. Notoriously damp, heated by vast and often smoky fires, lit artificially by candles and naturally by huge, ill fitting and often south facing windows, it is surprising so many still survive. Many also suffered the rigours of over zealous curatorship, with firms of decorators retained to ‘stick bits down’ or ‘paint over water stains’ and other damages with a terrifying selection of commercial glues and domestic house paints. Early attempts at conservation are also proving problematic. These may have been well meaning, meticulously carried out and often costly but such interventions were often based on practices which now seem archaic. Chinese wallpapers can occasionally be treated in situ by careful surface cleaning and consolidation of flaking paper and pigments, however it is more likely that the deterioration can only be halted by removal of the papers and full treatment in a conservation studio. After careful analysis and testing, this is likely to include the removal of old backings and glues, aqueous treatment of staining and acidity and repair and lining using oriental materials. 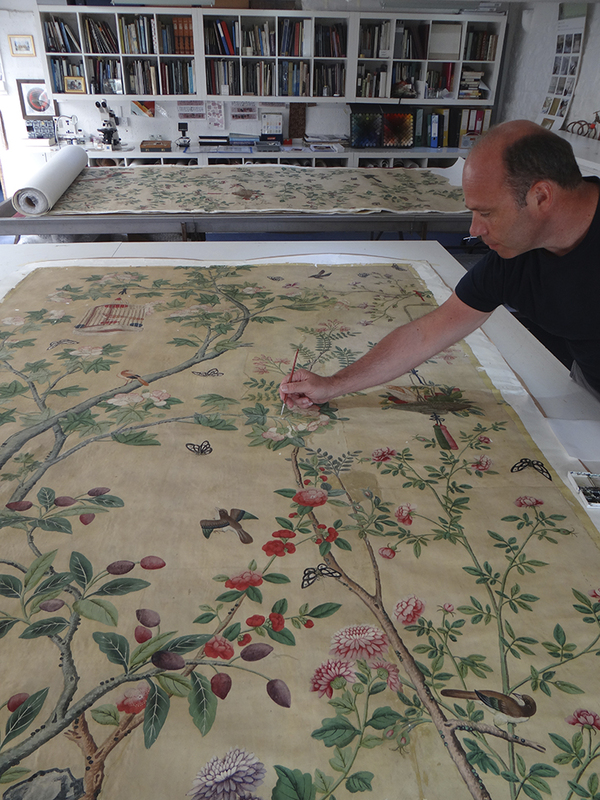 Once conserved, these can then be re hung onto a prepared wall and retouched using conservation quality pigments. Created from our collection of vintage Chinese Wallpapers, these are available to order. They are printed to the highest museum standards using conservation quality fine art papers and pigments. Lush, modern and elegant, these are available either as individual panels or as feature walls. Our designers can even create a whole room set on special commission. Field house, Awre, Newnham upon Severn, Gloucestershire, GL141EH.